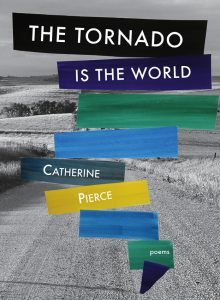 Catherine Pierce’s newest book The Tornado is the World (Saturnalia Books, 2016) follows her two previous collections The Girls of Peculiar (Saturnalia 2012) and Famous Last Words (Saturnalia 2008), winner of the Saturnalia Books Poetry Prize. In The Tornado is the World (Saturnalia Books, 2016), Pierce, a Mississippi poet originally from Delaware, tackles that big slice of America known as tornado alley as her speaker reckons with the world, by turns chaotic, treacherous, and blessed, through a poetic sequence that loosely follows the events of a storm that touches down in one town. In Pierce’s adept hands, the tornado, and thousands of other storms brewing in this collection, come to represent the speaker’s terror and wonder at motherhood. The book’s domain is a world off-kilter, where its very beauty is the element that damns and wounds. In “Rare Winter Tornado Sweeps Through South,” a title lifted from a news headline, early spring arrives as a blessing and a threat, paralleling the duality of Pierce’s treatment of motherhood. The beauty of an early Southern spring conspires against the speaker’s safety and her intact, known world. While acknowledging that “down here we’re crocus blessed,” the speaker notes that she feels “each sprig of green like a needle” (16). The change of season, seemingly so out of season, is an “unhinged sweetheart,” a mercurial darling that pummels the landscape with the same hands that once caressed it (16). In these observations of a season that feels artificially out of season, Pierce’s scavenging eye is reminiscent of Jean Toomer’s, another Northern newcomer to the South, who found his material in the foreign cotton fields and pine forests of Georgia. Similarly, Pierce studies her new landscape for omens, be they ants drowning in sweetness (53), the “winged denizens” of butterflies fluttering like “small pieces of drifting sun” (56), or the strikingly surreal image of “trout silvering the cotton fields” (25). The storm swirls in the speaker’s mind, a constant threat that throws into sharp relief the impermanence of a world in which everything and everyone must vanish. Even while boozing in the French Quarter, the speaker observes that the storm persists though contained momentarily for now: “You can buy me a hurricane, and we can/ stroll all night with storms in our hands” (17). These storms in their hands, suggestive of storms of their own making, threaten the domestic tidiness of the book’s many household spaces. “DESIRE,” Pierce writes, “is a lodestar” (17). The flare of desire’s warning signal blinds but only temporarily as we see the speaker’s charmed life with husband and son in “An Apologia for Taking Things for Granted.” In a reverie of banana-speckled walls and the insistent “buzz/ of the neighbor’s hedge clippers,” the mother narrates: “my heart/ begins its galloping, terrified and nearly detonating/ with gratitude it can’t contain” (54). Terror haunts each golden, ephemeral moment. Only one who loves the world so much has so much to lose. Jennifer Key is the author of The Old Dominion (University of Tampa). She currently holds a John and Renée Grisham Fellowship at the University of Mississippi. Her work has appeared in Callaloo, The Carolina Quarterly, The Antioch Review, and Poetry Daily.